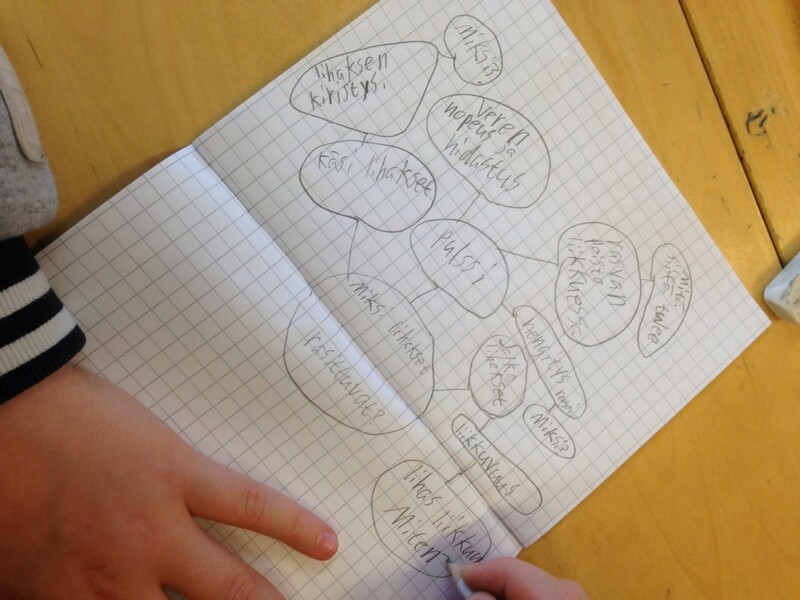 In this second post of my week in 52 weeks of Guided Inquiry I want to tell you about some of the observations I did during experimenting Guided Inquiry in Finland. As I wrote to you my background is in school libraries. In Kaarina city I had collaboration with two schools, where I connected with two teachers who were eager to try out new ways of working. One of the schools were Finnish speaking and the other was Swedish speaking. With the latter school we had already done a project for a national reading program in form of a reading diploma with exercises done also with a tablet computer. We entered Guided Inquiry from information seeking perspective and tried to work on amplifying the information seeking process according to Guided Inquiry Design. We did not use inquiry circles or journals. I am not going to present every project individually, but rather listing some issues that were interesting along the project. The last one, human biology, was the only one I did some information gathering of during and after the project. Information literacy is used in universities, but the concept has not reached the primary or secondary schools in Finland. Information seeking instruction or information literacy instruction are not a part of teacher studies per se. Surely teacher students are seeking information for their own needs, but it is another business to instruct the students at class. Information seeking instruction is quite often considered to be the job of a librarian. And it is usual, that in the 7th grade a librarian comes to visit the class for 45 minutes during the year to show how the local public library database works. We do understand, that this is not enough. It is usually not combined to some actual learning situation. This is not advancing the information literacy skills of the Generation Z or post-millennials, whose understanding of information environment is totally different than those of the previous generations. We clearly are in need of other kinds of methods. You have surely been reading about the Finnish schools during the years: Why are Finland’s schools successful? Finnish education chief: We created a school system based on equality. And an American on Fullbright scholar in Finland 11 ways Finland’s education system shows us that “less is more”. I am not going to go into how Guided Inquiry would change the education as such but rather concentrating on how this would change our perspective of information seeking in Finnish schools. I will not refer to any studies in this blog post. Several of my writings in my own blog refer to same sources. There are several studies that are showing that students tend to look for facts and also, teachers tend to make assignments so that one can carry it out by finding facts. We all know that the digital native reference is a myth and thorough deep information seeking is not common in daily classroom situation in Finland. I often like to refer to the ‘Principle of least effort’ by Zipf in 1949 as well. It feels oftent that the result is more important than the journey. First of all, the students were puzzled about the Open phase. Where are we going with this? As the students relaxed, the Immerse and Explore phases were cozy, they really got interested and talkative! They found it very difficult to come up with research questions, it was nothing they really had done before. They usually get the assignment from the teacher. At a very early stage they just insisted on starting to write the actual presentation, which indicated to copy/paste information behavior. They all had their booklet where they draw the mind map, writing up keywords and search terms and wrote down the sources they wanted to use. Information management in form of managing sources is poor. Inquiry Journals would have been perfect here for them as well! Mapping out the topic of their choosing was very difficult for some of the student. The mind map could be as large as 8 notebook pages. But, then positive things from the feedback questionnaires. Students liked the new way of doing things! There is still some curiosity left in a fifth grader! Most difficult phase was presentation! They were learning about information seeking right then and there, while working. Second and third most difficult phases were coming up with a topic and structuring it. They strongly felt that they learn something new, it was a different way to learn and it was fun! The teachers was happy that she had finally gotten a partner and she learned too! The students learned to see the librarian in some another role than just lending books and the professional role of the librarian was changed. This way of working brought also long term effects as the students started to use these methods even in the following assignment. These were the major issues I wanted to take up. The overall feelings of trying out Guided Inquiry were very positive and supportive, both from the students and the teachers. Me as the librarian in the project just loved working like this! Being among the students, involved in their work, guiding them and making an intervention when needed. Giving the student the freedom of doing research, they do manage it. In my mind Guided Inquiry is an excellent way of working, already from the primary school all the way to gymnasium. Now even more important than before. In the third blog post I will tell you about the educational change we are going through in Finland, about the new core curriculum, and how do I see Guided Inquiry fitting in. And it would fit perfectly!